I was browsing Ted Baker dresses from Javelin, when I clocked this beautiful dress, called Sonia. I rather love it. At first I felt it had this sort of sci-fi sophisticated look, with the hip wings and all, but then I quickly noticed how familiar it seemed. Fashion is limited in Mass Effect, and most women in the game wear a variation of this very dress! 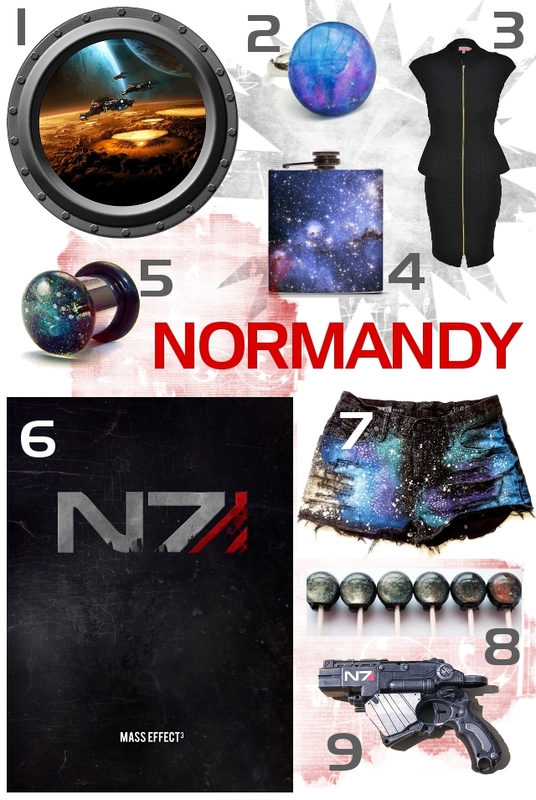 So it was only natural for me to create a Mass Effect themed moodboard, starting with this dress. The capped sleeves and hip wings really give it the sci-fi shape, and the zip straight up the middle certainly ads to its skin-tight fit and its easy wearing. The pencil skirt equally gives it a much more fitted look. Personally, if I was working in an office, this would be my favourite piece - understated with a definite air of fantasy and sci-fi, two of my favourite things.